I couldn't find a good modern adaptation of this singularly unique, useful, and controversial text online, so I decided to make one. It seemed timely. The original is fairly readable, but spelling and grammar vary widely. The "rigorously modernized" text keeps the sense of the original, but not the highly repetitive and formalized language. It is a non-academic adaptation, intended for a casual reader. The original is well worth reading though. Also, if you aren't familiar with the famous Shakespeare play, or the history of Richard III, this essay might be a good place to start. There is no gameable content in this post, but I will probably reference this text in future articles on laws, kings, schemes, parliaments, witchcraft, marriages, and people trying to claim legitimacy despite widespread unpopularity. 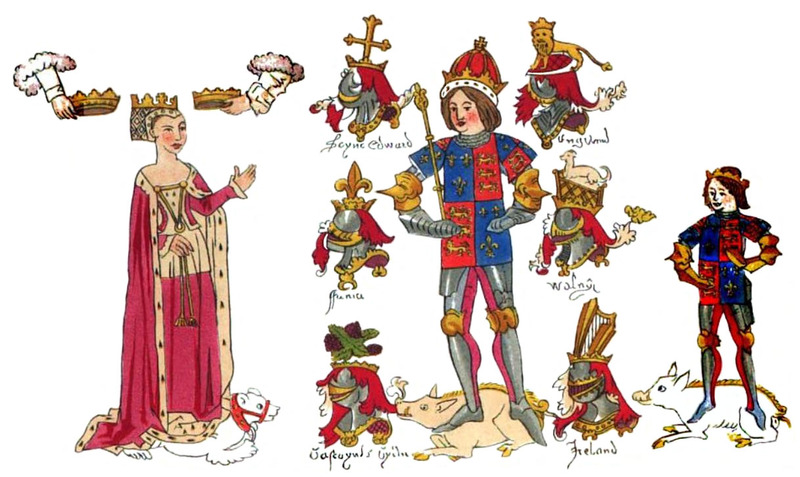 Rous Roll, Richard III and Family. John Rous, d.1492. Contemporary with Richard's life. Things used to be better. Then some lousy people ruled England and things were terrible. King Edward the Third married two women and also ruined everything. Therefore his children are illegitimate. Also the King's brother was a traitor. Therefore, his children are illegitimate too. Prince Richard is the only person left. He's very nice. We therefore ask him to become king. Also, since you people are ignorant, we are going to remind you that Parliament definitely has that power. No complaining allowed. Prince Richard is now King Richard the Third. We are also making Prince Richard's son his heir. To the High and Mighty Prince Richard, Duke of Gloucester. Please read this petition of the Lords Spiritual and Temporal, and Commons of this Realm of England, and give your assent. Everyone would appreciate it. In the past England was peaceful, prosperous, honorable, and tranquil. The Kings reigning followed the advice and counsel of certain Lords Spiritual and Temporal and other sensible people. They loved God, sought justice, and obeyed the law. The land prospered. England was loved by our charitable neighbors and feared by our malicious enemies. The land was honourably defended with great and glorious victories. Trade flourished, so that both merchants, artificers, and the poor prospered. No one knew poverty. But then the rulers of this land began to follow the advice of insolent, vicious, and greedy people, and spurned the advice of good, virtuous, and prudent counselors. They delighted in adulation and flattery. The prosperity of the land decreased daily. Joy turned to misery; prosperity to adversity. The laws of God and man were broken, and the land fell into misery and desolation. We, Parliament, must correct this with all due haste. Among other things, the late King Edward IV "married" - ungraciously and under false pretenses, as all England knows - Elizabeth, formerly the wife of Sir John Grey, and later called the Queen of England. In those times the order of the world was perverted. The laws of God and God's church, the laws of nature, and the laws, liberties, and customs of England - to which every Englishman is heir - were broken, subverted, and held in contempt. The land was ruled by whim and pleasure, fear and dread, with all laws broken and despised; all this caused murders, extortions, and oppressions, chiefly of the poor and helpless. No man was sure of his life, his land, his livelihood, or his wife, his daughter, his servant, and every good maiden and woman stood in dread to be ravished and befouled. And besides this, all Englishmen know of the discords, civil battles, and effusion of christian men's blood in that time. And also, we must consider that the "marriage" between King Edward and Elizabeth Grey was made with great presumption, without the knowledge or assent of the lords of the land, and also - as everyone knows - by sorcery and witchcraft committed by Elizabeth and her mother Jaquette, Duchess of Bedford. (If required, the case will be proved later, at a convenient time and place.) We must consider also that the "marriage" was made privately and secretly, without reading the banns, in a private chamber in an unconsecrated building, and not openly in the face of the church, after the law of God's church and the custom of the church of England. We must also consider that, before the "marriage" and a long time afterwards, King Edward was already married to Dame Elanor Butler, daughter of the old Earl of Shrewsbury. Since these things are true, as we have said they are true, it follows that King Edward and Elizabeth lived together sinfully and in damnable adultery, against the law of God and of his church. It is therefore unsurprising that the sovereign ruler of the land, being of such an ungodly disposition, provoked the ire and indignation of God and caused the troubles we have listed above. Evidently, the children of such a king must be bastards, unable to claim any inheritance, by the laws and customs of England. We must also consider that, in the 17th year of the reign of King Edward IV, the Three Estates of the Realm were assembled in a Parliament held at Westminster. By an act of that Parliament, George, Duke of Clarence, brother to the late King Edward, was convicted of high treason. All of his children were disinherited and barred from any claim to the crown and royal dignity of the realm. Therefore, we, desiring peace, tranquility, and public good, and the restoration of the land to its previous state of honourable prosperity, and remembering your great prudence, justice, princely courage, and excellent virtue, have chosen you, high and mighty Prince, as our King and Sovereign Lord, etc. And we humbly desire, pray, and require your noble grace that, according to this election of the Three Estates, and by your true inheritance, you will accept the crown and royal dignity. In case you do so, we promise to serve and assist your Highness as true and faithful subjects, and to live and die with you in this matter and in every other just quarrel. We would rather put our lives in peril and jeopardy of death than live in such thraldom and oppression as before, when we were oppressed and inured by extortions and new impositions against the laws of God and man, the liberty, old policy, and laws of the realm. May our Lord God, King of all Kings, by whose infinite goodness and eternal providence all things been governed in this world, lighten your soul, and grant you grace to do, in all matters, His will, to the common benefit of the realm. After great clouds, troubles, storms and tempests, the Son of Justice and of Grace may shine upon us, to the comfort and gladness of all true Englishmen. The right, title, and estate of our sovereign lord King Richard III, is just and lawfully grounded upon the laws of God and of nature, and also upon the ancient laws and laudable customs of this realm. All people learned in the law and custom of the land agree. Yet nevertheless, we must consider that most people in this land are not sufficiently learned in the aforesaid laws and customs. The truth and right of the matter may be hidden and not clearly known to all people, and thereby put in doubt. Experience has shown us that Parliament is of such authority, and the people of this land of such a disposition, that the declaration of any right or truth made by the Three Estates may quiet men's minds and remove all occasion for doubt and seditious language. Therefore, at the request and by assent of the Three Estates of this Realm - the Lords Spiritual and Temporal and Commons - assembled in this present Parliament, by authority of the same, be it pronounced, decreed, and declared that our sovereign lord the King was, and is, undoubtedly the King of England, by right of consanguinity and inheritance, and by lawful election, consecration, and coronation. By our assent and authority, be it ordained, enacted and established that the crown and royal dignity of the realm, and the inheritance of the same, rest and abide in the person of the king during his life, and, after his decease, in his heirs. We also declare that the High and Excellent Prince Edward, son of the King, is his heir apparent, to succeed and to have the crown and royal dignity, to have them after the decease of our sovereign lord the King, and for this inheritance to pass to him and to his lawfully begotten heirs.